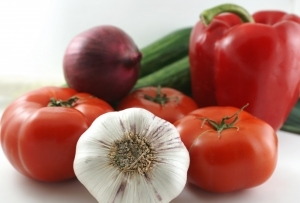 Live For Food » Blog Archive » How do you get your 5 a day? As most of us know, “5 a day” refers to the well publicized government campaign that we should all eat 5 portions of fruit and vegetables every day as part of a healthy diet. The intention behind this campaign was to simply get us all eating more fresh produce. A portion of fruit is one banana or apple, or a handful of dried fruit, or 3 tablespoons of vegetables (80g). Check out this link for more details on portion sizes. Frozen vegetables also count, as do tinned vegetables with no other additives. Also, fruit juice and beans or pulses can count towards the 5 a day, but only count as a maximum of one portion irrespective of how much you have. I think most people also know that potatoes don’t count as a vegetable in this context. They are treated like rice and pasta – as a starchy carbohydrate, not a vegetable. Although sweet potatoes DO count as a vegetable. (Are you confused yet!). Where did the goal of 5 a day come from? Well I seem to remember reading that following some research on fruit and vegetables the optimum number of servings a day was actually 8 or 9. But given that a lot of people hardly eat any at all, the UK average being around 2-3 portions a day, 5 was considered a more realistic target to engage the general public. On the other hand you get articles like this one, which state that fruit and vegetables aren’t a lot of good apart from a few vitamins and a bit of fibre. So I conclude that the number 5 is pretty much plucked out of thin air. However, in terms of your diet, 5 is an achievable number to aim for without being excessive. I probably get 3-7 portions a day in myself. Fruit and veg ARE healthy, they provide energy in the form of carbohydrates, they provide vitamins and minerals, and they provide fibre. They add variety to the diet, and fill you up for relatively few calories. Despite the number 5 being random, it doesn’t seem unreasonable. However the latest confusion surrounding the 5 a day seems to be the exploitation of this goal by food manufacturers. Many ready meals, processed foods, and even foods such as fruit bread come with claims on the packet that these items contain 1 or 2 of your 5 a day. Many of these foods are not fresh, and contain a certain amount of sugar, salt, and fat, which seems to defeat the object of the original campaign to get us all eating more healthily. It can only be used on approved foods, but there is nothing which stops manufacturers putting their own 5 a day claims and logos on packets. One of the sneakiest claims which has recently come to my attention is the logo “1/2 of your 5 a day”. Beware if you see this. It may not mean 1/2 of the whole 5, as in 2 and a 1/2 apples. It means 1/2 of 1 of your 5. As in half an apple. Obviously food manufacturers are there to make money. And we buy more of things that are tasty and convenient. We know that. But lets not kid ourselves. Some fruit bread and a ready meal is not fruit and vegetables. We all know this. If you buy a ready meal, buy it because you want it, not because it contains 1 of your 5 a day. And then buy some fresh or frozen veg to go with it. And a banana for dessert. Sorted. That is tricky when food manufacturers can “tweak” the good to make it not really all that good. I often wonder where those numbers come from.